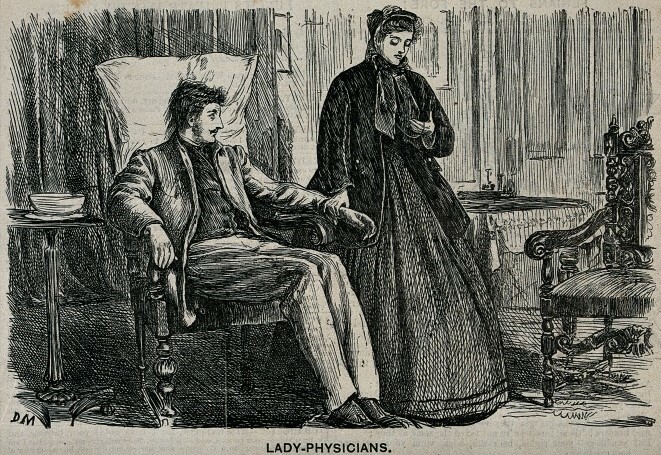 “Lady-Physicians”, Punch, 23 December 1865. Engraving by George du Maurier. Wellcome Images. For the last few months I’ve been trawling nineteenth-century medical journals to find evidence of male doctors’ views on women entering the profession. While I’ve discovered a huge spectrum of opinion – from the progressive to the vehement – when it comes to writing papers for the summer conference season, it’s (unsurprisingly) the barmiest reasons behind men’s antipathy to medical women that I’m hoping to shoehorn in. After one or two of my gems yielded laughs at the recent ‘Working with Medical and Health Periodicals’ Workshop in Oxford, I thought I’d share some of my personal highlights on this blog. I always try to read things like this without bringing 21st century attitudes with me, but number 10 is an absolute corker. It is so difficult to imagine that such an opinion would be stated seriously one can only hope Mr. Beham’s tongue was firmly in cheek whilst writing. Absolutely! I try my best to avoid passing value judgements in my research, but have to confess that the woman-doctor debates have really tested me! How things have changed. Having been unlucky enough to have developed cancer in both testicles I found myself treated almost entirely by women – the oncologist, the surgeon who did the bilateral orchiectomy, the nurses. The doctors of old were probably rolling in their graves with embarrassment.